Current members receive complimentary admission. Admission for non-members is $25 and includes membership through October 2006. Artist James Turrell creates sublime works that explore the phenomena of visual perception, light and space. Inspired by his Quaker faith, his work elicits an awareness of seeing, meditation, and transcendence. His “Skyscape” works combine architecture, sculpture, and atmosphere through rooftop apertures to the sky that visibly change with the time of day and year. Turrell’s acclaimed Roden Crater Project is an extinct volcano he has been transforming since the 1970s into a celestial observatory on the edge of the Painted Desert in Arizona. Other permanent projects include Skyscape and Night Piece at Live Oaks Friends Meetinghouse, Houston, TX; Light Reign at the Henry Gallery, Seattle, WA; Meeting at P.S. 1, New York; and Illumination at the Delaware Art Museum, Wilmington. 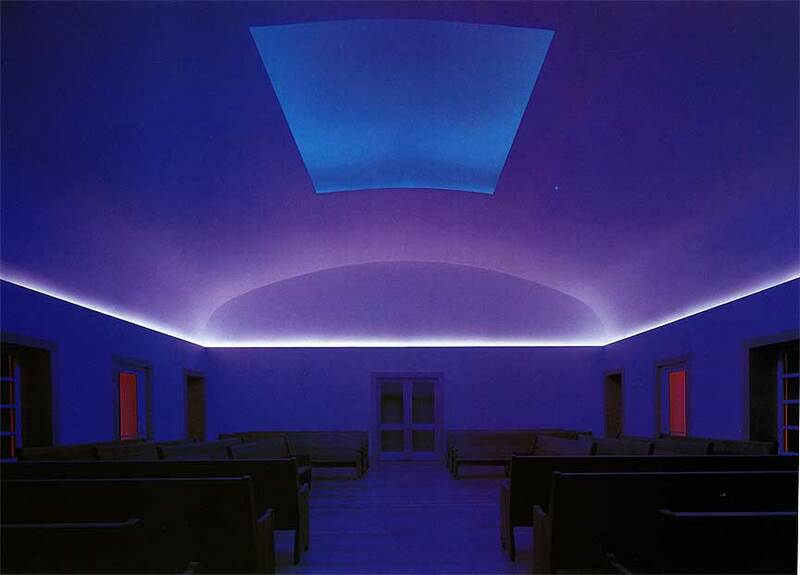 Night Piece (2000, interior) by artist James Turrell, commissioned by the Live Oaks Friends Meeting. Photo: Joe Aker © 2000.